What are the consequences of an American culture throwing away more than most other cultures produce? Where is today's life style leading us? Find out how YOU can help. No SOCIETY in the history of mankind has produced as much garbage as today's Anglo-American culture. Never before have so many thrown away so much — with so little thought or concern about the consequences. It appears that we are eagerly financing and fulfilling, ourselves, the Soviet threat of some years ago: "We will bury you!" — as we seem determined to inter ourselves in our own wastes! Bottles, bottles everywhere, and after just one drink.... Use it once and throw it away: beer bottles, pop bottles, baby food bottles — BILLIONS OF BOTTLES. "Dead soldiers" is a common term for used bottles, and it looks like that term is ever more apropos in the war of pollution. The only catch is: the dead soldiers are winning! Is there anything you can't can? Just because you can can, should you can? This year Americans alone will throw away more than FIFTY BILLION CANS — that's fifteen cans for every living person on the face of the earth! Cans (or tins) are very seldom manufactured to be reusable. Cans preserve things for us to use — they also preserve themselves in a nearly immortal manner that is of no use at all! Add to this the nondegradable waste from over four billion dollars' worth of plastic jars and bottles every year — they are of no use after one use either! Forget the nearly inestimable tonnage of regular packaging waste. For the United States alone you'll have to add to the junk pile about eight million old TV sets, another eight million autos that won't run any more and have to be disposed of in some manner. Along with those cars you'll have to get rid of one hundred million old tires that don't have a mile left in them, but are still good for a thousand years with little decay. With all of this great garbage we have just begun to pick at the surface. Industrial wastes, agricultural wastes, household, commercial and municipal wastes must be added. Throw in the daily paper and the odds-and-ends waste and you come up with the astounding figure of over ONE HUNDRED POUNDS OF GARBAGE PER PERSON PER DAY that has to be disposed of in some manner in today's Anglo-American society! That's over 18 tons per person per year! The trash you put in your garbage can for the local sanitation crew to remove is the small — about 5 % — visible (but not for long) representation of the total amount of refuse necessary to maintain you in the life to which you have become accustomed. At the beginning of this decade a wave of popular interest has been sparked by the sudden recognition of the fact that mankind is rapidly turning his small planet into an uninhabitable garbage dump ! In all too many areas this knowledge has been quickly transformed into a political football. But serious scientific studies from nearly every field are pouring data into man's total fund of knowledge which indicates that nothing can really be thrown "away." For many decades we threw our garbage "away" into swamplands and marshes. This caused us to realize, a little late, that a delicate balance in nature has been upset. Entire species of animals disappeared. Entire industries based on harvesting the animals and fish life that the marshes produced went out of business. We dumped industrial, human and agricultural waste into our massive river systems — beautiful rivers which seemed so powerful, untouchable, indestructible. Then we discovered the awesome destructive power of collective human beings! Multiple thousands of miles of waterways became too polluted to drink without massive doses of expensive cleansing chemicals — too lacking in oxygen and other life-giving elements to support the life of commercial or sports fish — and finally so loaded with too many salts and other harmful chemicals that they become unfit even for irrigating agricultural fields. Those streams sluggishly make their way to sea to contribute their deadly "fallout" to the ocean. We dumped untold tons of evil smelling particulate matter, that corroded and besmirched everything it touched, into our air until each great accumulation of human beings — called cities — has its own pall of smog that signals its presence even to astronauts in deep space! The mighty ocean seemed able to cleanse itself of any refuse we wanted to throw "away" — from the accumulated waste of human sewage to the multiple millions of barrels of oil spillage, both deliberate and accidental. But now we begin to see that even the ocean has its limit. Entire coastal areas have been denuded of all animal and vegetable life by indiscriminate dumping of human trash, dregs and rubbish. Entire industries once supported by the sea, from commercial fishing to tourism, have in all too many areas gone bankrupt — a tragic return on the deposit man didn't think he was making. So the consequences are beginning to be noticed. We notice we don't have clean air. We notice we don't have pure water. We notice we have less and less productive land. We notice that the entire ecological web of life has been brutally ruptured! In short, we notice that we do not like the product of our way of life! Noisy efforts on every hand are being made to fight the consequences of our life style — our polluted environment. Politicians of every ideological background imaginable all seem vociferously in agreement with the fact that something must be done, and done soon, to correct this pollution trend before we suffocate and strangle all life on the earth. Groups from every walk of life, business and industry, education and science have reacted with teach-ins, seminars, be-ins — and the great, massive effort of April 22, Earthday! All too often these efforts fall into the same category as the cliché about the weather: Everybody talks about it but nobody does anything about it! Every manufactured product — particularly those most guilty of pollution — will probably now be advertised, in the light of this consciousness of environmental garbage, as a dedicated step in the direction of cleansing the earth! Following the same pattern as other warnings which have been given in the past, these responses to the consequences will be no more effective than the response to the consequences announced regarding the dangers of cigarette smoking. If you can remember that far back, you will recall that every cigarette company immediately came out with activated, surefire, live charcoal, super gas trap filters! Advertising assured the public that these filters stood as a firm guardian between any cancer-inducing product and the customers' vital organs. Hundreds of millions of words later, and hundreds of billions of cigarettes later, the grim toll of smoking-induced deaths still claims many more than a thousand lives a day! Yet by now — incredible as it may seem — so many other, and more massive evils loom on the horizon — nuclear annihilation, the population explosion, worldwide famines, crime in every category, race riots and general civil disorder, etc. — that the cancer threat from cigarette smoking seems to dim to insignificance. I am not saying, "It's no use worryin' — nothin's gunna turn out all right!" Not only is there something which can be done about this pollution problem — but I can confidently tell you on the highest of authority that something WILL BE DONE ABOUT IT! Something totally effective-and soon. Everybody seems to be getting into the prophecy game — politicians, Students, educators, scientists. The general consensus of all these prognosticators paints a pretty gloomy picture. The world scene painted by their frighteningly accurate forward projections of current trends vividly portrays a world of total cataclysm! All point to this decade as the DECADE OF DECISION! If we make it through these next ten years, the consensus is, then we may have a chance to restore some semblance of order, of health, of prosperity in the world again. But there are an awful lot of ifs in the projections. If the entirety of mankind is not wiped out by nuclear war. Or germ war. Or nerve gas war. If we can somehow double and then triple the production of food and forestall the deaths of hundreds of millions in massive famines. If simple laws of hygiene and medical science can continue to stand as a thin barrier against the overwhelming ignorance of the great bulk of mankind and the carelessness of the rest in this tidal wave of pollution, then we can prevent vast, worldwide pandemics of diseases — such as bubonic plague and death dealing dysentery diseases, Asian super-flues, rabies, and hoof-and-mouth disease in cattle. All these predictions are made with sober, yet alarmed shock, by many groups of people who begin to see the handwriting on the wall. Yet these events were long ago forecast and put down in writing to forewarn us of massive problems before we came to this time and finally recognized them in high gear! But basically, the book in which those statements were written down has been rejected by mankind as a whole. Most feel it has no practical, serious application to real, daily life. Without shocking too many, may I simply say that Book is the Bible. If you could be carried back 2000 years to the time of Christ — if you were given the opportunity to write down, in a form which would remain permanently available to mankind, a succinct warning (in 300 words or less) of the vast problems that present themselves to mankind today — would you do as well, using simple words which would have meaning in every age, in describing today's world conditions as the words of Matthew 24? That chapter in your Bible outlines the major crises which would be today's seething worldwide problems, prophesied by Jesus Christ as loud alarms that would signal His return to this earth. Fortunately that prophecy in Matthew 24 goes beyond the dark and hopeless statements made by sincerely alarmed and educated men today. Matthew 24 not only offers hope of a solution to the problems, but absolutely promises that solution with the same authority and absoluteness as the prophecies of the evils which must come before the solution! Read it sometime. So on that Authority of all authorities, I can confidently tell you that rather than seeing our earth by the turn of the century as a burned-out chunk of cosmic cinder floating lifelessly through space, dead by the hand of its highest form of intelligence — that rather, by the turn of this century, the entire atmosphere of this earth will have been cleansed and returned to the pristine purity of the Garden of Eden. That all the water on the face of the earth, now polluted by man's greedy way of life will be returned to the sweet, fresh, life-giving substance it was created to be. That all the tortured land will be restored to a beautifully productive state. That the last war will have been fought. That every nation will live in peace with every other nation under a worldwide government! But is there nothing you and I can do, now? Am I saying we should leave it all up to God? Granted, only God can solve all of mankind's problems ! And God plans to solve all of mankind's problems — soon! No, I do not advocate the reasoning too many use in too many instances where the evils are abundant. The idea seems to be in everybody's mind — "What good is it for just one person to try to do things right in a world gone wrong?" Everybody tries to get the other fellow to change. When will we all learn that you can't control others but you can control yourself? Each of us has an individual responsibility. There are things each individual can do. There are ten things listed in the box on the previous page that you can do that will help solve this pollution problem. It may seem a small thing, but somebody has to make an effort somewhere. Even though you as only one individual do it, your effort really involves more than just you as an individual. You do not pollute. You help remove the pollution of others. And you are an example to those who see you. Now, am I kidding myself into thinking that your lone action and my lone action will solve the worldwide problem? No, I do not think so. The world, in all probability, will have to go through the sad prophecies of both man and God. But thank God, God gives definite promise of good news on the other side of the bad! Our human problem is not measured in bottles and cans, plastic jars and oil spills, polluted rivers and sterile oceans. The human problem is the attitude, the nature which produces these signs, which are mere evidence of its evil. Where each of us must change, and where we each stand alone, where we are not judged by what the world around us does but by what we individually do is in our attitude, our character, our frame of mind, our bent and way of life. What causes us to be a no-deposit, no return society is the full expression of our human nature ! That nature wants to get and never give. In addition, that nature wants to get for nothing. The something-for-nothing society, the go-now-and-pay-later society, the get-yours-while-the-getting-is-good society is motivated by an attitude of total disregard for the laws God obviously set to keep nature in balance. And, more important, it's motivated by a total ignorance of spiritual laws that same God set in motion to cure the cause of our no-deposit, no-return society! We have been led through a materialistic and commercial fantasy to believe that the good life consists of the abundance of things we are able to have around us. We have got what we wanted! As a civilization we have accumulated around us more things than we know what to do with: hence a garbage society! We don't like the garbage. We don't like the consequences of the way of life that led to the garbage. But we still insist on living the way that produces the result we don't like! It is not really a no-deposit, no-return society. There has been a fantastic deposit — labor, energy, industry, materials have gone into producing more garbage than any other society ever created ! Now our no-deposit philosophy has returned to us the dividends we do not want. It is the mentality which is the cause behind the problem that we see in the consequences about us that must be changed. It is the mentality of a no-deposit, no-return society which must be altered — and it can be altered in you as an individual if you respond to this reasoning. Obviously all the answers cannot be given in any one article. 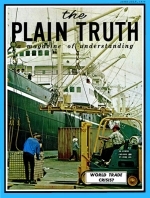 If you are interested in more of an in-depth analysis of today's world problems in the light of spiritual knowledge from God's Word, the Bible — if you are interested in solutions offered without apology, without denominational prejudice, frankly and plainly from the pages of your Bible — then you should be reading TOMORROW'S WORLD. The Graduate School of Theology of Ambassador College publishes, free of charge, a monthly magazine (bi-monthly as is Plain Truth for the remainder of this calendar year) called The Good News of TOMORROW'S WORLD. "The new TOMORROW'S WORLD magazine was designed originally, when started last June, to serve the 125,000 regular contributors who were supplying the financial needs of this Work. But after issuance of the first number we felt that many others — readers of Plain Truth, and listeners to the worldwide broadcast, The WORLD TOMORROW, would also want to receive this sparkling new magazine of Biblical understanding, edited by the Graduate School of Theology of Ambassador College. We offered it. The circulation skyrocketed. In these few months it has grown from the initial 125,000 copies to nearly half a million — 475,000 copies the last issue — 350,000 new readers beside contributors." I invite you to join the more than a million interested readers of TOMORROW'S WORLD. Interested because they find the hypocrisy of today's world stripped away and the positive solutions to practical problems in straight-from-the-shoulder Bible answers! Some articles in the current issue: "Is There a Conspiracy Against Fatherhood? ", "Christians Have Lost Their Power," "Lent, Ashes, Easter, Rabbits and Eggs, What's it all about?" plus 16 more pages added in this anniversary issue introducing new features: "Why Today's World Is in Revolt — and the Answers! ", "Science vs. Theology," "Answers to Your Questions" and much more. If you are not afraid of the Bible and its power in the Space Age, ask for your TOMORROW'S WORLD, today! It's free, of course. 1. DON'T LITTER. Teach your family not to litter — from the car, sidewalk, campsite, at work, school or home. It costs 30c of your tax money to pick up each roadside beer can (This does not include disposing of it), and the average mile of highway has 590 such beer cans — and 770 paper cups, 730 cigarette packs, 360 bottles, and 90 beer cartons. Motorists drop 15,000 pieces per mile per year in America. What a savings of scenery AND money if we ALL QUIT LITTERING! 2. DON'T USE NON-DEGRADABLE PACKAGING. You, the consumer, have unlimited power to change the packaging industry. The plastic bags which choke fish and fowl to death, the styrofoam packaging and plastic containers which defy destruction, the plastic beer can loops which have choked sea birds to death, and all forms of "immortal plastics" which are used only once then discarded, can be used NOT AT ALL if enough people refuse to buy products contained in them. 3. BUY ONLY DEPOSIT BOTTLES. Each returnable-type bottle is used to make 19 round trips before retiring. Most of today's battles are junked after one usage. The power of the consumer has already been displayed here, as the bottle industry has changed their $7.5-million advertising program from stressing no-deposit bottles to stressing DEPOSIT bottles. 4. TEACH THE CLEANLINESS HABIT to your children, from infancy upward. If children have the habit of picking up after themselves, throwing things into the wastebasket ONLY, not throwing away items that are STILL USABLE, they will not increase the "per capita" trash that experts are predicting by 1980. 5. PICK UP LITTER. Of course it would be impossible for just a few people to pick up all the litter. But you can make your world neater than when you found it. Pick up litter around your home, your yard, your office, your school, your campsite or motel room; don't throw garbage under your theater seat or basketball bleacher. 6. BUILD LIFE INTO YOUR CAR. Over 7 million cars are junked annually, many of them abandoned by the roadside. That's two tons of pollution that can be prevented by a little care. The average car coming out of Detroit has a total life-span of six years (it was 10 years a decade ago). Much of this is OUR fault, With careful driving and maintenance, and limiting our trips to the necessary ones, we could double the life of our cars. And when it wears out, sell it to a steel scrap agent, DON'T ABANDON IT! 7. RECYCLE YOUR NEWSPAPERS. One half of all household trash is paper or paperboard products. Much of this is newsprint, with a Sunday edition in a large city weighing as much as 5 pounds! Many paper companies are beginning to recycle newsprint for unlimited reusage. For every 118 pounds of old newspapers you return, you save one tree, say the company spokesmen. The San Francisco Examiner reports, "The only 'X' in this equation is the willingness of individuals to save old newspapers as a personal contribution toward preservation of the quality of the total environment" (April 26, 1970, p. 24). If your city does not have such a service, write to your newspaper. Contribute your paper to them, to rescue more trees from becoming more trash. 8. START A COMPOST HEAP. Less than one percent of municipal trash is eventually composted, but a much larger percentage of your household trash could and SHOULD be. Organic materials — egg shells, meat by-products, fruit and vegetable waste, etc, — should be returned to the soil by natural means, Learn the principles of composting and build a compost pile in your backyard. But be careful to follow proper health rules in composting. Check with city authorities for local regulations. 9. BUILD CRAFTSMANSHIP into what you make. If YOU work in a factory, or if you women make clothes or crafts at home, build a long life into what you make. If ALL our manufactured products were constructed with care, a great number of TV sets, clothes, cars, appliances, and other prematurely defective items would not enter the trash heap so soon. 10. RECYCLE AS MANY ITEMS AS YOU CAN. This applies not only to newspapers, but a multitude of items. Various companies buy old no-deposit bottles or aluminum beer cans for 1/2c each. Other organizations have "paper drives." If your clothes, toys, or furniture are old but usable, don't "junk them," but contribute them to some charitable group which can continue USING the items. Before junking any item, ask yourself, "Can this be used again?" Once it enters the garbage can, nobody uses it!